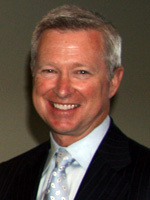 Stephen Bruce, founder of the Bruce Initiative on Rethinking Capitalism. 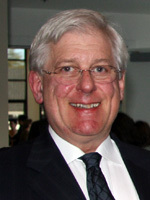 Professor Bob Meister, director of the Bruce Initiative. 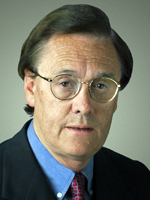 Horace "Woody" Brock, founder of Strategic Economic Decisions, will kick off the conference with Bruce and Meister Thursday, April 7. 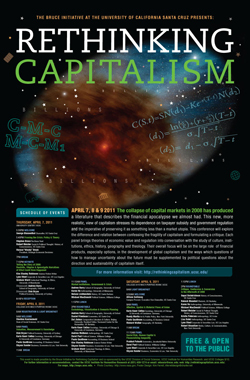 The second annual Rethinking Capitalism conference, April 7-9 at UC Santa Cruz, will investigate the social systems that help prop up and preserve capitalism in the aftermath of the crisis of 2008. The conference is free and open to the public. "Now we’re drilling down," said Stephen Bruce, founder of the Bruce Initiative. "This year we will look at social systems and questions of distribution and allocation." Bob Meister, director of the Bruce Initiative and UCSC professor of political and social thought, said post-crisis analysis has so far focused on what went wrong. The question remains, and this is the conference theme: "What do we do now that we know how fragile capital markets are," Meister asked. "Do we have to pay any price to prop up a system that we know can't last forever?" Examining those questions over two days of presentations, panels, and roundtables will be an international slate of legal experts, economists, anthropologists, accountants, theologians, and even Kim Stanley Robinson, a science fiction author known for his Mars trilogy, a look at settlements on Mars after Earth's destruction. Who better than a science fiction writer to imagine what might happen after the financial and environmental apocalypse that would follow the collapse of capitalism, Meister said. Headlining Thursday night's opening session "Framing the Crisis: Policy and Theory," along with Bruce and Meister, is Horace "Woody" Brock, founder and president of Strategic Economic Decisions, a leading analyst in the economics of uncertainty, who regularly consults with corporations, central banks, and government administrations. The keynote panel includes Lynn Stout, professor of corporate and securities law at UCLA law school and a regular commentator on the PBS Newshour; Graham Ward, professor of theology and ethics at the University of Manchester; and science fiction author Robinson. Rethinking Capitalism is co-sponsored by the Bruce Initiative on Rethinking Capitalism, the UCSC Division of Social Sciences, UCSC Institute for Humanities Research, and Colleges 9/10.